We videotaped one of Luke’s recent 25 minute private lesson at the Chicago Blue Dolphins Swim Studio. Luke is a 5 year old boy who is on the spectrum, and he has been taking lessons with Chicago Blue Dolphins for about a year. See how far he’s come and hear from his mom, Tareema, how swimming has benefited Luke. With drowning being one of the leading causes of death for children with autism, we felt that it was critical to for us to bring in the market leading teaching method to our programming, Swim Angelfish’s Swim Whisperers® program. Swim Whisperers® is a unique program designed to address the underlying barriers to learning rather than just the symptoms. 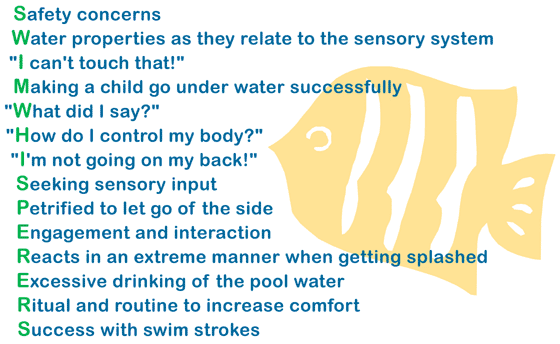 The Swim Whisperers® program identifies 14 of the most common roadblocks seen in teaching children with sensory difficulties (see graphic to the left). By understanding the art and science behind teaching children with sensory or motor skills issues, our specially trained Swim Whisperers® swim instructors can help your child become safe and independent faster and more efficiently than traditional methods. The focus of our program is on swim skill acquisition, water safety and confidence in the water. Our instructors are not licensed therapists – they are swim instructors. However, we welcome input from therapists, educators, and you, the parents, to help make the experience as fun and beneficial as possible. The most common strategy in our Special Abilities swim lessons is for children to begin with 25 minute private lessons. In these private lessons, we will identify any roadblocks, break through them, and start to develop core swimming skills. We will then progress to semi-private lessons where we can establish the routine and social interactions of a group environment. After success in the semi-private lessons children will transition to one of the group swim classes in our learn-to-swim programs. Our goal is help transition your child from private lessons to a group learn-to-swim class. The prices for private and semi-private lesson tuition is shown in the table below. When your child is ready for the semi-private lessons, our instructors and office staff will help find a good pair for your child and coordinate schedules with the other family. If you are unsure where your child fits in to our group class progression or whether private or group classes best meet her needs, contact our office to schedule a 25-minute Skills Assessment lesson. Our instructor will run your child through a series of exercises to determine her current skill level and then will give you an overview of the skills progression that best matches her skills and goals. If you opt to move ahead with one of our private lesson tuition plans, you will be charged for a $20.00 annual membership to cover insurance and safety costs. If you continue on with us beyond one year (and we hope you do), you will be charged the annual membership fee on each anniversary you have with us.